Based on a graphic novel that is loosely based on a real life event, this film is clever. It contains a great twist in the middle that you don’t see coming. Hugo Weaving is awesome, conveying so much through a mask for the entire film. And one learns a bit about Guy Fawkes in the process! V is a man with a vision and a purpose. Although his methods are violent and a bit warped, you have to admire that he never wavers. He sticks to his values and convictions. Mark is a writer, devoted father and husband, and resident Irish Madman. We know Mark is a stay-at-home dad – what does his wife do? There’s a line in the film about God playing dice with the universe, which originally came from this line – “At any rate, I am convinced that God does not play dice,” an objection to quantum theory. Who said it? U’s trivia answer – In Geek mythology, “Selene” means the Moon. Tara Tyler gave me her Ultra Blogger Award for my encouraging attitude and the IWSG. Thank you, Tara! I can’t think of a better person to pass it along to than A to Z Challenge founder, Lee at Tossing it Out! Check out SA Larson’s SITE for details – lots of great prize packages. 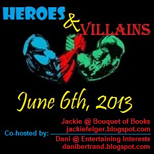 Jackie at Bouquet of Books and Dani at Entertaining Interests are hosting the Heroes & Villains Blogfest on June 6. Visit their sites for details. Have you seen V for Vendetta? Think Mark is a Madman? (In a good way of course.) Remember Blue Murder? Signing up for the charity giveaway? Joining the blogfest? Excited about Juliana’s book? And can you believe we’ve only four letters to go…? I love Mark and no, he isn't a madman. Mark has amazed me from Day One and I'm glad I can call him a friend. I'm a big Mark Koopman fan! An all around great gut Mark is. Thanks for giving Mark his props. Let's hops Mark never develops homicidal tendencies hahaha! I love Mark! One of my favorite blogs for sure! :) And V for Vendetta was an awesome movie. I really enjoyed it. Thanks for the info. on Dani and Jackie's blogfest. Sounds like fun! I had a feeling you'd pick this movie. I thought of this one, but it didn't have as much impact on me when I watched it the first time so I didn't include it in the list. It does seem like the alphabet's gone by quickly, but that's easy for me to say as a mere spectator. Juliana's book has a wonderful cover. Mark is an awesome blogger. I love the cover reveal. I have seen V for Vendetta. It wasn't bad, but nothing extraordinary. I had expected more, after the first trailers and the promising casts. Not a fan of the film but I am one of Mark's. He the real deal, as genuine as they come, helpful, honest, forthright, and silly as the Mad Hatter! Most of all, Mark's a great family man. They don't come any better. Cheers to you, Mark! Great tribute, Alex. V for Vendetta is one of my favorite movies. And as for Mark being a madman... Aren't we all? Congrats to Juliana on her fabulous book cover! Nice tribute to Mark! I remember Vendetta, it was quite a good movie! Good choice highlighting Mark, he is a great guy! Congrats on receiving Tara's award! Oh, I am sooooo glad you didn't pick "V" the TV series, 'cos I am an alien, but I swear I have my papers, gov'nor. Seriously though, thanks very much, my non-hyperlinked friend, for honoring me as one of the 26 and look, I'm featured on the 25th, which is great, 'cos it's my birthday tomorrow, the 26th... alas I am no longer 25. Vendetta is one movie with a message and unexpected twist, yet very entertaining. End the end you kind of say - yup, got it. I preferred the comic to the movie. Alan Moore never seems to get the adaptation his work deserves. V was a good movie. I had to watch it twice cause the first time I missed what was going on and was quite confused. Which is easy to do I'm afraid. Ha! The tribute to Mark is spot on. That Irish Mad Hatter is a steadfast and amazing guy. Thanks for the blogfest shout out! Juliana's book looks like a cute read. I believe Mark might've mentioned on his blog before that his wife is a nurse...I might be wrong though! Congrats Juliana on her book cover, looks very good. Pleased Mark got the match of the day, lovely write up. I have seen V for Vendetta, but liked the book better. Einstein quoting Max Born's original German paper on Hidden Variables Theory. Madman Mark! He's going to love this. Great pick, Alex. I really enjoyed the movie V for Vendetta. I have enjoyed the journey through the alphabet. I at least know the two main actors for this movie. That's an achievement, right? The Alphabet has really gone past so fast. i thought it was yesterday I was writing my C post. Where did the letters go? Never saw V. And I'll be checking out Mark's blog. I saw "V" and enjoyed it. Mark is a great choice! And congratulations to you on the award and Juliana for her great cover! Never saw the movie. Congrats on the award! Have not seen the movie, but I loved your tribute to Mark. He sounds like someone I would like to know. I'd like to see the film. Mark is a maniac in a good way! Congrats to Juliana, very nice. Someone already posted this, but the quote was from Einstein. My son is currently obsessed with Egypt, so as soon as I saw "Valley of the Kings," I thought about the real one, not the song. Stephen, good thing he's trapped on an island! Lynda, I think it's the only V movie I own. Mark, you're welcome! And happy birthday. Moody, I've never read it. Sandra, very good! And the real one is the subject of the song. Blue Murder and Einstein quotes in the same post? I'm freaking out! V for Vendetta was a good one to give a run. 4 more and done, it's been fun. I can't remember what his wife does, but I sure would love to be where they are. Hawaii!. Nice recognition for Mark. Mark is absolutely hilarious and a great guy. Good choice. Lots of good stuff in this post. That heroes and villains blog hop looks fun. Go MARK! I'll need to check him out. Mark isn't a madman, but his friends are mad about him -- for good reason: he's a fun, creative man. V FOR VENDETTA is one of my favorite films. How are you holding up towards the end of this race? Oh, and I voted. Your book is #36 so far. woot woot! Mark is awesome! Great pick. I liked Vendetta, I thought it was pretty good. And it is a solid choice for V in the challenge. Have gotten to know Mark through you, he is quite sweet, not at all a madman. Hey, I'm a stay-at-home dad, too! Minus the kids, of course. But hey, if you count books as kids, I'm raising 6 of the little buggers with another on the way. Always another one on the way. We're like the literary Duggars. Nice Birthday present. Congrats to Mark and yes a mad man in a very nice way! Enjoyed V but had to watch twice to get it all. And yes, only 4 more, TG! Mark is cool. As for the trivia, I believe it was Einstein who originally said that line. He really did not like quantum theory. Loved V for Vendetta. Both Weaving and Portman were exceptional. We can skip the homicidal tendencies. I did sign up for Jackie and Dani's blogfest. V for Vendetta is great and Mark definitely is a madman, in a good way! Only four letters left? Yikes! I can't believe we only have four letters to go! I do know Mark and I agree with everyone, he is the man! Congratulations on the award. You are an ultra blogger! Perfect passing it along to Lee. Thank you for the award recognition! Did you know I'm a stay at home dad as well? Except my kids all moved out years ago so I'm here alone all day. Mark is awesome!! Love his values and his writing! Signing up for the blogfest. And I know that trivia, but I just can't quite remember it. So many awesome bloggers I haven't visited yet during the challenge and as usual, lots going on in the community. Of course Mark is a Madman, but in a very wonderful way. I imagine he never sits still for very long or at all! I'm suppose to see Vendetta with a friend next week. Vendetta sounds like a good movie to check out. Boston was hard. So many bloggers are expressing heart-felt (heart-wrenching)thoughts about it. I'm a bit more numb than anything else. Has our world really changed that much? I refuse to live in fear! I enjoyed V for Vendetta more than most people around me. Hugo Weaving makes the movie; I'm still stunned how he and the cinematographer conveyed so much using a static mask. V for Vendetta was in my top 10 list for the blogfest not too long ago. LOVE that movie. And congrats to Juliana, her cover is beautiful. Of course Mark is a madman. He's a writer, primary caretaker for small children, and keeps his head shined. I have heard great things about Mark. I wonder what his wife does? Will have to wait until tomorrow to find out, I guess. I'm watching the Blue Murder music video as I type this. Fabluous hair and clothing choices--totally 80's. I like the guitar solo. I thought V for Vendetta was an interesting movie. I really like the part where he had a small speech part ALL with V-words. I shall have to add this movie to my list of to be watched. I follow Mark, I really enjoy reading his blog. Yeah, Mark is the whole enchilada! I really liked V too. I didn't know Hugo played him though. I feel a bit silly not knowing that. Looking forward to the covergirl's blogfest! Mark is one amazing guy Alex and V was an amazing film. Not as good as the novel, but I admire Portman's commitment to the character. I love movies with a twist. Another one to add to my list. From what I know of him, yes Mark is a good madman. :) Congrats on your award and great choice with Lee. Hallelujah only 4 letters to go! Is that Geek or Greek mythology? Just wonderin' because there are a lot of nerdy types who love space junk and I might have been pulled into a vortex or something. Okay. Not only is V for Vendetta my FAVORITE movie, you put the madman along with it. Today. Is. MADE!!!!!!! Seriously dying. I don't know why I find the whole SIGGY thing funny, but it seriously cracks me up. Brilliant, Alex. You've put a smile on my face for the rest of the day! I thought Weaving was great in "V" and really made the movie for me. I can't believe Rusty is the only one to come up with Einstein so far, unless I missed someone else. And, just to say, it actually wasn't a graphic novel. It was a pretty long comic series that was later collected as a graphic novel. I may have some of the original issues around somewhere. My wife and I are both big fans of V is for Vendetta, both the movie and the graphic novel. My husband's a huge fan of Mark's. I have not seen Vendetta, but now want to see it! yay! I love both V for Vendetta the movie, and the comic/graphic novel series. And I'm so glad someone else besides me mentioned V. Wonderful and complex character. My little brother loves V for Vendetta. He insisted we all watch it with him one time, and my parents couldn't stop commenting on how they thought it didn't make any sense. My brother gave up trying to explain it to them, and that it's just a movie. Mark is definitely a madman. Jackie, you're welcome, and thanks! Brandon and Bryan, I think that's an original. Lee, that's the best kind. Laura, that made me chuckle. Julia, they were a late 80's band. Maurice, I don't think I would've shaved my head. Morgan, I'm here to amuse! Andrew, I think there are three of you so far. So awesome of you to highlight Mark today! And I loved V for Vendetta. You are absolutely right! It's a clever movie. Magic V, V for Vendetta, it could be nothing! i don't remember blue murder... v for vendetta was a movie i saw once, never to see it again... not even in passing. great post. V for Vendetta was an amazing film. Mark K. is a cool madman, gotta love him. Congrats on your award from Tara and Juliana's cover looks great. I need to watch that movie. I bought it a year or so ago, but it's just been sitting in a drawer. Love V for Vendetta. Curious about the Boston book giveaway, I need to check that out. I liked the fact that it has a historical basis, but I don't generally like or trust people in masks, for some reason. I think it's that I can't read their faces. (I loved the show 'Lie to Me'. Of course, if they happen to be a superhero, the mask doesn't bother me. V for Vendetta is a great movie (Mark is a great choice too)! Just wanted to stop by and say thanks again to you, Alejandro, and for all the very sweet and kind comments. I was introduced to V for Vendetta by a friend a few years ago, and I loved it! It's a great film. Hi! :) Happy Thursday ... I have not seen V is for Vendetta- but will have to check it out. Cheers to Mark! And congrats to Juliana Haygert on her cover reveal...very nice- i love it. Jeremy, Blue Murder was John Sykes' band. Cherie, be sure to take the wrapping off first! Mark, glad it made your day! Very good movie and I love that picture of Mark! Mark is a total madman and I am glad you turned me on to him. He's truly wonderful. So much good news and congrats on the award. And high fives for passing it to Lee, a truly exceptional man. I have seen V is for Vendetta. It's a good movie. And Mark is a good pick! He wrote about the Boston explosions. One of the things I was most surprised by recently was that none of the blogs I follow talked about them. So I became an instant follower. Mark is such an awesome person. He has made me laugh so many times, he's one of my favorites too. And I loved that movie and I think V is a great character. Already signed for the Hero and Villain Bloghop. 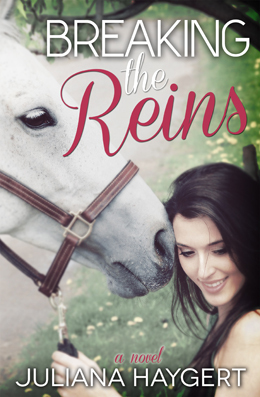 That book looks good, Breaking the Reins. I nearly missed W, I only discovered I had written it at the weekend. Melissa, I could think of no other. Tony, his post was very heartfelt. Al, your entries should be great. Mel, love the Kate, didn't like the movie. I've read lots about "Mark The Madman"... he's quite a character! I loved V for Vendetta. I also thought it was cool that Hugo Weaving did a whole movie without showing his face, says a lot for him as an actor. Husband Unit loves V for Vendetta. Mark is a great choice. It's been a long time since I saw V for Vendetta. I've been wanting to watch it again. I may just join the blogfest. Will definitely pass it along, though. Vendetta was a good film. Blue Murder-have not listened to them in a long while! You could almost make a whole trivia quiz about Blue Murder-that was an example of a successful supergroup! I haven't seen V is for Vendetta, but it's a cool shout out for Mark! Brandon, he did an amazing job. Larry, very true. Had they done more than one album, I'd say GTR did it successfully as well. We have V on DVD. My kids like it a lot. Mark is a madman in all the best definitions of the word. I know I've seen this movie but I don't remember much about it. Must have been doing two things at once. Right then, in between tweeting, I shall delight you with one of my eagerly anticipated comments. Mark is a superb choice. Even though I don't know him that well, my adoring fans have told me about him. Can't quite see Mark as a mad man, unless it's during one of those times when he's chasing the kids around the house to gather them for bedtime. Koopmans rocks. Wonderful bloggie friend and virtual brother. I need to watch V again...it's been a while. I know I'm late to the party, but Albere Einstein said this in reference to the emerging quantum mechanics view regarding inherent randomness and probability. And you gotta love Mark! He's a real hoot. Love the cover art for Juliana's book. And I wrote the "X" post today....that was a very fun challenge. Another great choice! :) Mark rocks! For once I know a quote -- I think it was Einstein. As for Mark being a crazy writer: you do realize that saying "crazy writer" is redundant. We're all non compos mentis. YAY for Mark.... he's a great guy! I FINISHED ALEX! Wrote my Z post tonight. I am SOOOOO happy. At least it was a fun one. Do you know I have to post on my birthday? Bummer. Thank heavens for scheduled posts and iPhones to keep up with everything. LOL. A great tribute to Mark! I loved Vendetta too - I'm really intrigued now - what was the event the comic was loosely based on? V for Vendetta freaked me out...but also made me think, so I'm glad I saw it! Have not seen that movie. Boy, I really gotta start watching ore movies. V for Vendetta is an impressive movie. Hi Alex .. Mark may be mad .. but he's a huge bundle of energy and the love of his family and of life shines through .. I think she's a nurse. I'll have to watch it again, but I remember V for Vendetta being a little trippy for me. Great choice for V! I really liked it too, although it wasn't one of my faves.